Summer is upon us, and one of the best things about this season is relaxing with friends. The longer days and sultry nights lend themselves well to evening entertaining, but who wants to spend a lot of time in a hot kitchen? Entertain with no fuss and less muss using these ideas. Gather your friends, and hit up the Party in Elmwood on Thursday nights. With a weekly schedule through September 27th, your summer social plans couldn’t be easier. Be sure to take note of the special tap nights featuring different local breweries. The hours are 5:30-8:30, and you can bring your own lawn chairs (but no coolers). A rotating schedule of food vendors provide tasty treats to help fuel the evening. Plan a progressive restaurant party. Progressive parties are fun, but let’s face it, making three different entities clean their place for appetizers, main course, and dessert should not be legal. Who has that kind of time? Instead, opt for a progressive party, and hit up your favorite local restaurants in downtown Roanoke. Need suggestions? Start your evening at the River and Rail for artisan cocktails. The drinks menu reads like a summer dream with specialty ingredients such as cucumber infused tequilas, pineapple syrups, lemon rhubarb bitters, and house raspberry cordial. Reservations are available, so you’ll find it easy to set a time and get the evening rolling. With a daily selection of creative appetizers, you can get a bite to eat and enjoy your cocktails and company before heading down to Blue 5 restaurant for some delicious southern cuisine and live music. Specialty items include Shrimp Creole Grits, pastas with homemade sauces, a nice selection of burgers, and more. After such a delicious dinner, it’s time to finish off the evening with ice cream at Blue Cow, Roanoke’s very own small batch ice cream company. They offer classic flavors (like brown butter pecan, Oreo, and Blue Cow patty) all year long, but be sure to check out their seasonal flavors for a fresh and unique treat. Keep it simple with a “Skip the Dinner” party. Invite your guests to bring an appetizer or dessert, and forgo the main course entirely. 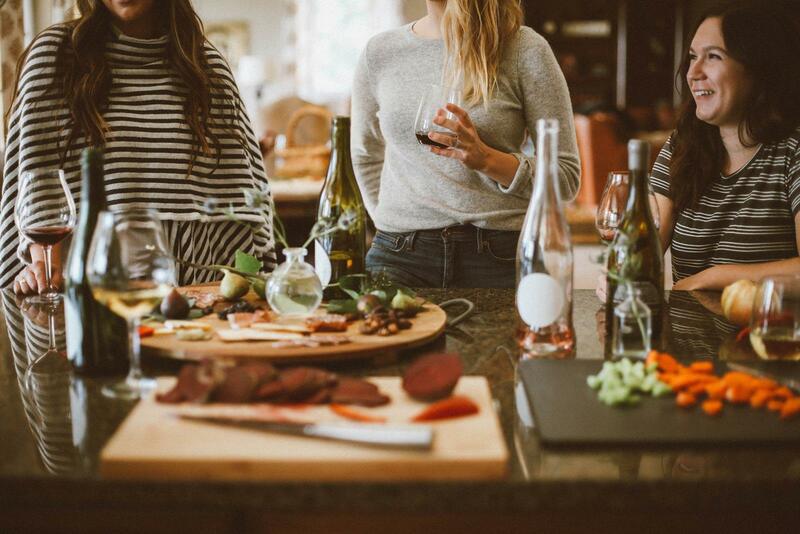 A variety of finger food keeps the prep down and the mood casual with lots of opportunity to move around and talk to everyone, instead of being stuck at the dinner table. As the host, concentrate on preparing one or two heavier appetizers, such as meatballs or wings to round things out. What’s your favorite way to enjoy time with friends in the summer?